Ruskins specialises in supplying and planting trees, hedges and shrubs. We specialise in the supply and plant of large trees, shrubs and hedges, from a single specimen to large scale planting. The full range of nursery grown specimens are supplied either from our own stocks or from an extensive network of growers throughout Europe, from whom we have sourced trees for over 25 years. We will also plant trees you have sourced from elsewhere. 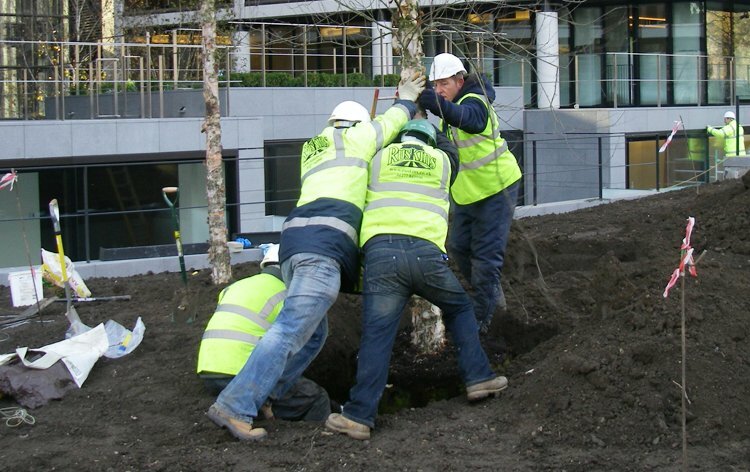 If you are daunted by the prospect of utilising large trees, we can assist you at all stages of the project, to ensure you obtain a cost effective, workable solution supported by an aftercare partnership. We provide a 'planting only' service for clients who have purchased their own specimens, but also require the necessary expertise to unload and plant. We can liaise with growers and hauliers anywhere in Europe, to collate orders, care for specimens prior to delivery and generally ensure smooth project planning on your behalf. At Ruskins we pride ourselves on our ability to work with clients, often alongside other contractors, to tight time schedules, limited budgets and in difficult site conditions. We appreciate that you may have the expertise to unload / handle / plant the specimens, but we are willing to provide a partial service i.e. locating the trees in planting pits and allowing yourselves to take over at a suitable point. We are happy to work with your staff / contractors to achieve the optimum result for you. All work is undertaken to the highest horticultural standard, using experienced, trained staff. Our aim is to exceed your expectations and to win your confidence - much of our work comes from repeat business or referrals.